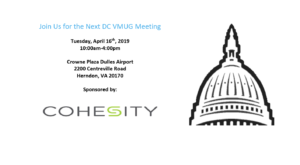 Join us for the upcoming Washington, D.C. VMUG meeting, sponsored by Cohesity This is a great opportunity to come together with your fellow VMware users to discuss virtualization trends, best practices, and the latest technology! 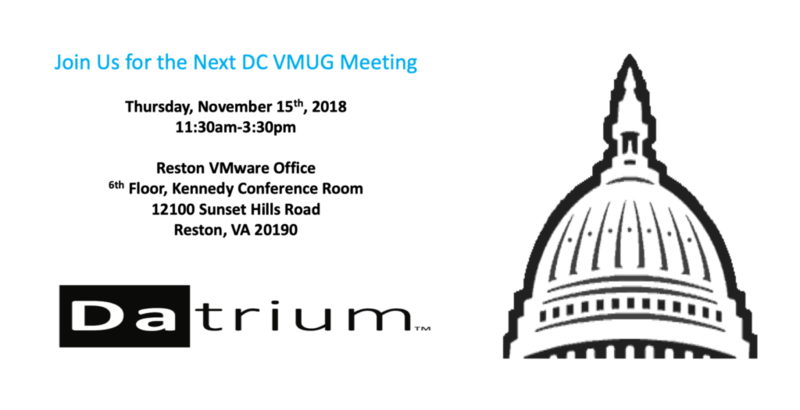 Join us for the upcoming Washington, D.C. VMUG meeting, sponsored by NTT Communications! This is a great opportunity to come together with your fellow VMware users to discuss virtualization trends, best practices, and the latest technology! Attention DCVMUG & MyVMUG members! Our next event, sponsored by Datrium, is scheduled for November 15th (11:30am-3:30pm) at the VMware Reston office. 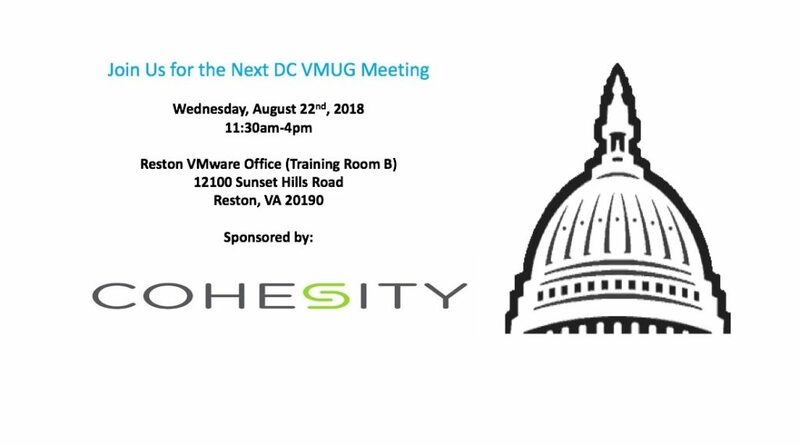 Our next event, sponsored by Cohesity is scheduled for August 22nd (11:30am-4pm) at the VMware Reston office. UPDATE: Thomas Walker (VMware) has kindly offered to provide a presentation on VMware NSX & The Virtual Cloud Network (Unfortunately, Jad has been asked to attend a meeting outside of the area and will not be able to join us on 8/22 but we hope to have in near future). Chuck Mills (VMware) – Horizon based offerings on- premise including public cloud, Azure & AWS. Our next event, sponsored by Presidio, is scheduled for June 13th (11:30am-4pm) at the VMware Reston office. Registration ends on Thursday, December 7th, 2017. This a great opportunity to connect with your fellow VMUG members at the event and get involved in your VMUG community. We look forward to hearing from you and most importantly, getting to see everyone in person in the near future. The 4rd annual Potomac Regional VMware User Group (VMUG) User Conference is scheduled for Thursday, April 16, 2015 from 8:00am – 5:00pm. The Potomac Regional VMUG User Conference is an all-day event hosted by the DC VMUG (DC and NoVA), the Maryland VMUG, and the Federal VMUG. For more information, visit the VMUG Event details page. Registration will open soon! Be sure register to reserve your spot at the conference. Interested in sponsoring this event? Please visit our Sponsorship Opportunities page or contact us at sponsors@vmug.com. Feb 19th Meeting with PernixData! Join us for the upcoming Washington, D.C. VMUG meeting, sponsored by PernixData! This is a great opportunity to come together with your fellow VMware users to discuss virtualization trends, best practices, beer and the latest technology! And did we mention beer? Be sure to visit the Washington, D.C. VMUG Workspace and subscribe to our listserv! Connect with your fellow VMUG members in the forum, ask and answer questions about VMware, and get involved in your VMUG community. Registration is open and included as part of member benefits for all VMUG members. Registration for this event will close on Wednesday, February 18. Registration is now open and available to all VMUG members. This is a great opportunity to meet with your peers to discuss virtualization trends, best practices, and the latest technology! Space is limited – please be sure to register now! Visit the Washington, D.C. VMUG Workspace and subscribe to our listserv! Connect with your fellow VMUG members in the forum, ask and answer questions about VMware, and get involved in your VMUG community.